Kitty (@truly_radical_) contacted me over Twitter some time ago and emphatically stated that she wanted to talk with me about research. 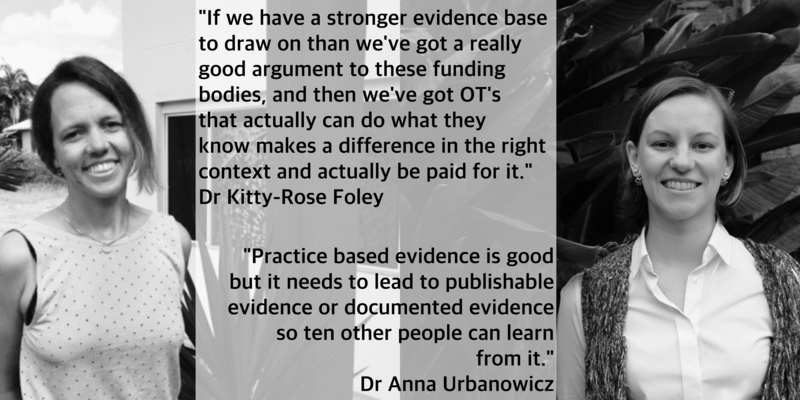 She told me that herself and fellow OT, Anna (@aurbanowicz) had a huge passion for promoting research to Occupational Therapists. She wondered if I would like to talk about it with them on Occupied…. definitely! Dr Anna Urbanowicz and Dr Kitty-Rose Foley did their PhD’s at the same time in the same place. This lead to two very different directions and experiences. Sitting down and chatting with the two of them highlighted the challenges and rewards of completing research and a PhD. Anna is Australian but currently in the United States as a VC Postdoctoral Fellow (Fulbright Scholar) at RMIT University. Learning inclusive research techniques to bring back to her work in Australia. We talked about their respective journeys through PhD and into Post Doc. From there we went on to explore why research is important to the profession and various ways that OT’s are able to get into it. The key takeaway is that research isn’t scary, it just takes a little bit of planning. With this in mind you have the opportunity to add to the evidence base of the profession using your own clinical experiences. For me personally this a great follow-on from episodes 013–014 about transitioning to academia and I’m def more driven than ever to get stuck into some research! I’m excited!